Patricia A. McMahon scoured through birth certificate books dating from the 1950s. 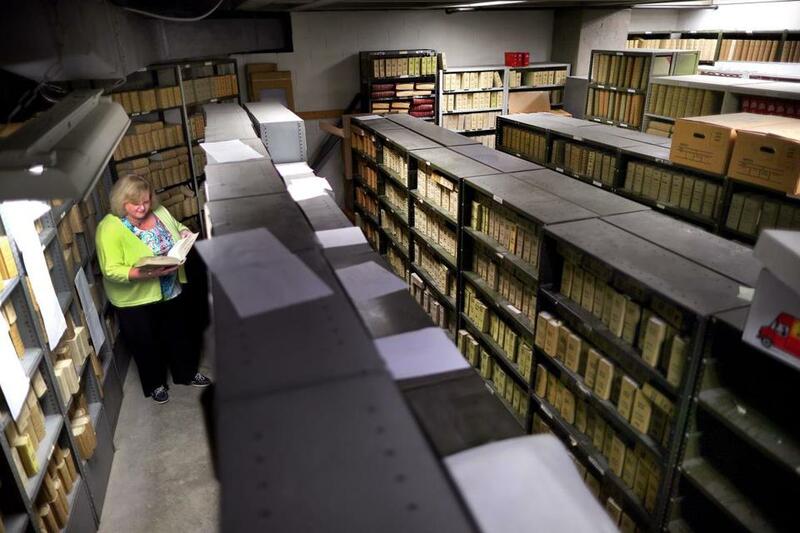 The books are stored in the “dungeon,” as she calls it, in the bowels of Boston City Hall. It took 52 years for Donald Cohoon to learn that his first name wasn’t really Donald. Never mind that the construction worker had been baptized “Donald.” Or that he had “Donald” on his driver’s license and marriage certificate. Parents may have eventually called the new baby Peter or Robert or Patricia or Donald, but they never bothered to go to City Hall and officially add the name to the birth certificate. Back then, a baptismal certificate was enough to register a child for school or Little League. Now digging up the original document can create bureaucratic conundrums for unnamed adults such as Cohoon. Officials told Cohoon he could not get a passport with a birth certificate that listed “Baby Boy” as his given name. His mother told him he was born jaundiced, Cohoon said, and the family did not expect him to live long enough to warrant a name. In Boston, where large, Irish-Catholic broods dominated the city, “No Name” is more than the quirky moniker for that century-old restaurant on the Fish Pier. People without first names find a sympathetic ear in Patricia A. McMahon, who oversees Boston’s registry for births, deaths, and marriages from a second-floor office that feels like a bunker. This birth certificate from 1955 lacks a first name. Like others of her generation, McMahon used her baptismal certificate to get a driver’s license, Social Security card, and other government documents. Security tightened after the terrorist attacks of Sept. 11, 2001, she said, and baptismal certificates no longer suffice. Hospitals have also tightened regulations, McMahon said, and require parents to fill out birth certificate forms before leaving the hospital. The phenomenon is common enough that the city has a form letter describing steps to resolve the issue. Officials can not check for a first name on a record until a request is made for a certified copy of a birth certificate. To amend a record and add a first name, people need to provide documentation. The evidence — a baptismal certificate, school record, or doctor’s note — must include a full name, birth date, and the parents’ names. Robert K. Ehlers faced the challenge. In 1967, a military recruiter discovered that Ehlers lacked a first name, but it did not prevent him from serving 25 years in the Marines. Ehlers knew why his parents ignored the hospital paperwork: He was born extremely premature, he said, and his parents spent his early life running between their South Boston home and St. Margaret’s Hospital. “The birth certificate probably got put on the back burner,” said Ehlers, who now lives in Hooksett, N.H.
For most of Ehlers’s life, the blank first name on his birth certificate didn’t matter much. He got a driver’s license, traveled oversees in the Marine Corps, and collected retirement and Social Security benefits. But New Hampshire tightened regulations, so when Ehlers went to renew his driver’s license, he discovered he needed a birth certificate. He found a baptismal record and used it to amend his birth certificate, but there was a catch. Because the baptismal record only had K as a middle initial, he couldn’t get his full name — Robert Kenneth Ehlers — on his birth certificate. His middle name had come from an uncle killed in the Korean War. “They couldn’t give me the name of Kenneth,” said Ehlers, now 69. The case is more complicated for Peter Paul Fisk, who was abandoned at birth at St. Elizabeth’s Hospital in Brighton. 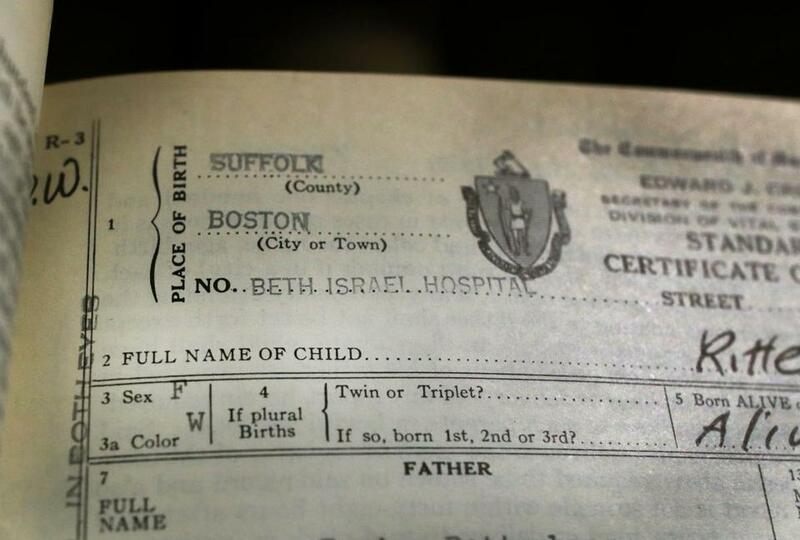 Fisk’s birth certificate has an “M” — presumably for male — in the blank for the first name, according to his stepson. As a child, Fisk bounced among 10 foster homes. His stepson said Fisk does not have records that include his name and the names of his biological parents — a requirement to amend a birth certificate and add a first name. Fisk’s lineage can be traced back to Colonial America, according to his stepson, but he needs a birth certificate to join organizations such as the Mayflower Society. Fisk, a Korean War veteran, needs a birth certificate to obtain military resources to help with his burial and other benefits. Andrew Ryan can be reached at andrew.ryan@globe.com . Follow him on Twitter @GlobeAndrewRyan.